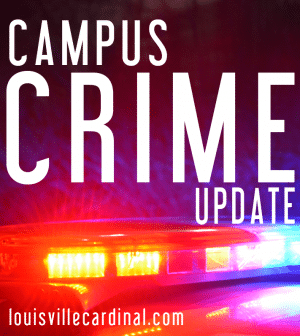 The University of Louisville Police Department is investigating an armed robbery of a student at the Province apartments that occurred around 4 p.m. Feb. 4. A RAVE alert was sent out at 4:40 p.m. notifying campus a U of L student reported an armed robbery. The RAVE alert described the suspect as a black, male, wearing a grey hoodie and black pants. The suspect was last seen heading towards Seventh Street in a silver/ gold Pontiac or Oldsmobile. This is the third robbery in the last 14 days, the first was Jan. 21 and the most recent, Jan. 29. Both the Jan. 21 and Jan. 29 robberies occurred at Fourth and Brandeis. There is currently no other information available. Students, Faculty, and Staff are advised to call ULPD with any information at (502)852-6111.